The day started off being quite productive. I was actually able to paint the tops of two benches and the top of a table I am repainting for the front porch. We took a break and decided to take a ride to the carousel...it was closed. 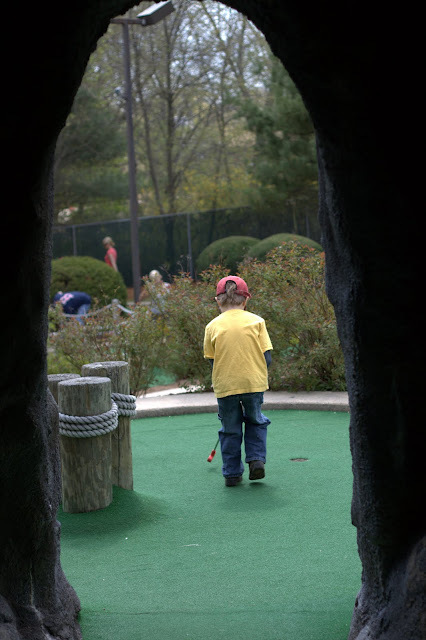 E suggested we go miniature golfing...good call, we had fun and E even got a hole in one! After that we went for some Del's Lemonade and then to BJ's for a couple things. So here comes the slightly annoying part...later in the day, I went to put the newly painted furniture (that had been left in the isolated thunderstorm) inside the garage. When I was moving it, I noticed that some of the paint appeared to be bubbling. I'm guessing that because the paint wasn't completely dry, when it got wet, it started to bubble.....lovely! Guess I'm resanding and repainting for a second time because it was such a blast the first time. Yes, I know there are worse things, which is why I'm only slightly annoyed. Below are some pictures of the day's events.